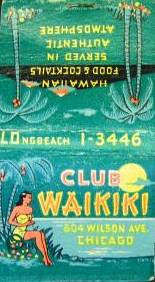 Club Waikiki, 804 Wilson Ave., Chicago. LOngbeach 1-3446. Hawaiian Food and Cocktails Served in Authentic Atmosphere.